Rio Rosa Mosqueta oil is pressed from the hips of a wild rose that grows in the Chilean Andes mountains - Rosa affines rubiginosa, commonly known as Rosa Mosqueta. 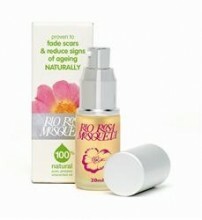 South American women have used Rosa Mosqueta for hundreds of years as a beauty oil - but scientific research into its properties has led to a broad use of the oil for the treatment of scars and other damage to the skin, and the it is frequently used in cosmetics designed to combat wrinkles, stretch marks and other signs of ageing on the skin. Rosa Mosqueta rosehips contain an extremely high concentration of Essential Fatty Acids (primarily Omega 3 & 6 fats), and the oil is higher in the Gamma Linoleic Acid (G.L.A.) than Evening Primrose Oil, Starflower Oil or Blackcurrant seed oil. Rosa Mosqueta also contains trans-retinoic acid – a naturally occurring compound related to vitamin A that is also part of the explanation for Rosa Mosqueta’s effectiveness in the treatment of damaged skin. Click the button below to add the Rio Rosa Mosqueta 20ml to your wish list.